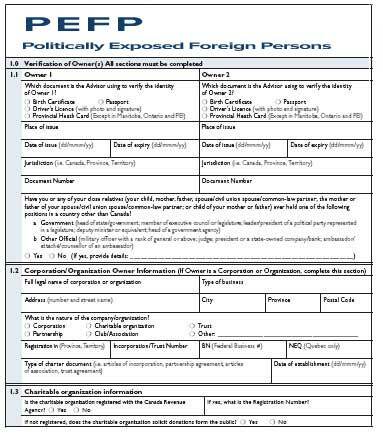 PEFPs are individuals (or their direct family members, and/or the person on whose behalf they are making payment) who now hold or ever did hold a senior position in or on behalf of a non- Canadian: government, civil or diplomatic service, military, government-owned corporation, political party or court. For more information on PEFP please visit the FINTRAC website. The Financial Transactions and Reports Analysis Centre of Canada, or FINTRAC, is Canada's financial intelligence unit, a specialized agency created to collect, analyze and disclose financial information and intelligence on suspected money laundering and terrorist activities financing. Created in July 2000, the Centre is an integral part of our country's engagement in the global fight against money laundering and the financing of terrorist activities.